As the idea of language immersion is fairly new to our area, you have searched for pictures of what a Spanish immersion classroom may look like. We understand, it’s still a foreign idea. Recently, I spent the day in Ms. Maria’s class and I thought it would be a neat idea to bring you along! So, come on in, let’s have a virtual tour! 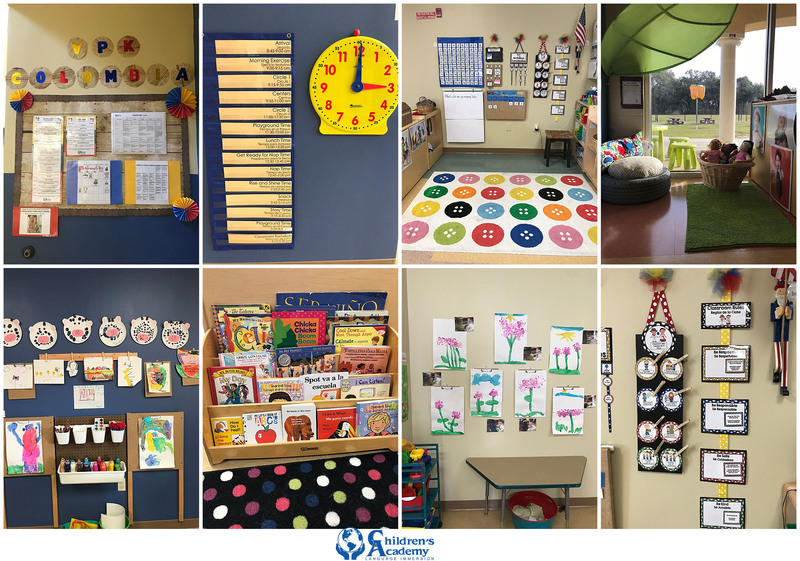 A VPK (Voluntary Prekindergarten) dual immersion classroom can look a lot like a traditional preschool classroom. You will see books, activity centers, circle time area, and more — but you will also see all these things in Spanish AND English! Spending time with Ms. Maria made it apparent to me that our teachers are supportive of our students transition into a second language and they know when to introduce new words and sentences for each child. Many children will enter the classroom at a difference place for their immersion experience. Our teachers are in tune with each child’s needs. When I asked Ms. Maria, our VPK teacher, how she implements Spanish into circle time this is what she shared! I wanted to know more about how Ms. Maria teaches Spanish in her classroom, so I asked her to tell me more about center time when she was able to have more one on one with each child. I saw this first hand when I visited! I was curious what Ms. Maria loved most about being a Language Immersion teacher. “I love when the children make an effort and have that desire to learn a second language! They are hungry to learn new words and new concepts. It makes me happy when they are not scared to try. I enjoy helping them become confident in their new language!” ~Ms. Maria. And what are some of the benefits of being bilingual? Learning Spanish makes you self-sufficient, increase self-esteem, boosts social skills, develops creativity, opens the mind and helps us adapt to change. Spanish is the second most widely-spoken language in the United States. Bilingualism is proven to increase cognitive abilities. Children who grow up speaking more than one language often have linguistic, cognitive and psychological advantages over monolingual speakers. Bilingual children are creative, develop stronger problem-solving skills and are more capable of adapting to and coexisting with other cultures. Bilingual children enter the professional world with increased employment opportunities as adults.